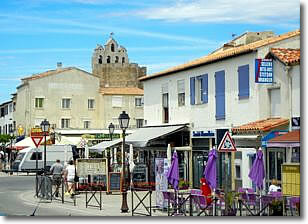 Wildlife, beaches, and beautiful scenery make the Camargue a lovely place to visit. La Camargue, the broad salt-marsh delta of the Rhône River, extends south from Arles for over 30 km (19 miles) and covers 85,000 hectares (328 square miles). Now protected as the Parc Naturel Régional de Camargue, it teems with birds and other wildlife, and is famous for its local breed of horses of a lineage stretching back to prehistoric times. These distinctive horses are still seen roaming about the Camargue. You can visit La Camargue on a day-trip using Arles as a base, or spend a beach holiday at Les Saintes-Maries-de-la-Mer on the southwestern coast of the delta. Here's a delightful short story about a visit to the Camargue. As you ride through the flat landscape of the Camargue, whether in car, bus, bicycle or on horseback, you'll see huge black bulls grazing in the fields. These strong animals are bred here for the bullfights and Courses Camarguaises (traditional Camargue bull games) still staged in Arles, Nîmes and other Provençal towns, and in Spain and Portugal. 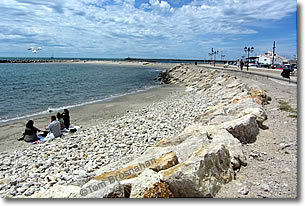 Above, The beach at Saintes-Maries-de-la-Mer. 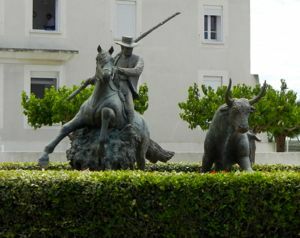 Below, Bull fighting monument, Saintes-Maries-de-la-Mer, France.